Friday Flowers—doesn’t that just bring a smile to your face! Flowers are perfect any day of the week, but especially on Friday. Fresh flowers add instant color and scent to any room—and always put a smile on your face. Flowers make a room feel comfortable and inviting; they make a simple alfresco meal feel special. The stunning bouquet pictured was sent to me by my husband—probably as an “I’m sorry” gift because he had to be gone all weekend, again. Husbands take note: flowers are the way to our hearts. How about a fresh flower delivery every weekend—heaven. This all-white arrangement is from Keven Hawkins’s new flower shop here in Cashiers, North Carolina—Keven Hawkins Mountain Living, (828) 743-6800. They look great next to the window in the Master bedroom and smell amazing! Enjoy the flowers and your weekend! Holly, It smells wonderful too! You have to pay the shop a visit when you come to Highlands. Beautiful and white is sure a cool look for this hot day in Atlanta. Love the material she used. Lynn, That is my master bedroom here in Cashiers! Oh my goodness those are beautiful enough to be a bride’s bouquet! I have such a weekness for flowers! I would not be able to resist anything in his shop. Dangerous territory! Kelly, Very dangerous territory! You will want it all. More on the shop soon. 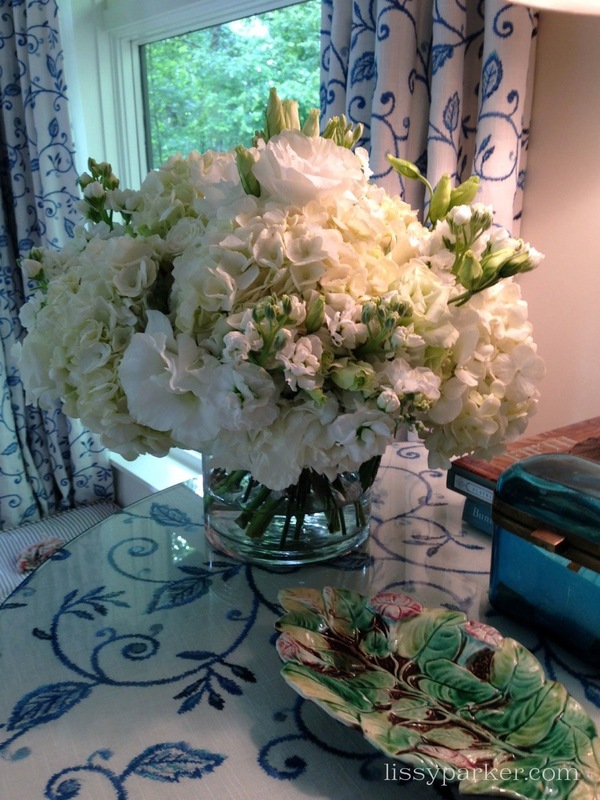 I love fresh flowers and there is nothing I love more than an all white arrangement. We live about four hours from Cashiers and have talked many times about visiting – this may be our summer! Happy Monday! That sounds great! The smell was fantastic—all the way down the hall. I love fresh flowers in my house all the time. Would your husband call my husband please! !